ARN-509 is a selective and competitive androgen receptor inhibitor with IC50 of 16 nM, useful for prostate cancer treatment. Apalutamide, also known as ARN-509 and JNJ-56021927 , is an androgen receptor antagonist with potential antineoplastic activity. ARN-509 binds to AR in target tissues thereby preventing androgen-induced receptor activation and facilitating the formation of inactive complexes that cannot be translocated to the nucleus. This prevents binding to and transcription of AR-responsive genes. This ultimately inhibits the expression of genes that regulate prostate cancer cell proliferation and may lead to an inhibition of cell growth in AR-expressing tumor cells. Apalutamide (INN) (developmental code name ARN-509, also JNJ-56021927) is a non-steroidal antiandrogen that is under development for the treatment of prostate cancer. It is similar to enzalutamide both structurally and pharmacologically, acting as a selective competitive antagonist of the androgen receptor (AR), but shows some advantages, including greater potency and reduced central nervous system permeation. Apalutamide binds weakly to the GABAA receptor similarly to enzalutamide, but due to its relatively lower central concentrations, may have a lower risk of seizures in comparison. The drug has been found to be effective and well-tolerated in clinical trials thus far, with the most common side effects reported including fatigue, nausea, abdominal pain, and diarrhea. Apalutamide is currently in phase III clinical trials for castration-resistant prostate cancer. Recently, the acquired F876L mutation of the AR identified in advanced prostate cancer cells was found to confer resistance to both enzalutamide and apalutamide. A newer antiandrogen, ODM-201, is not affected by this mutation, nor has it been found to be affected by any other tested/well-known AR mutations. Apalutamide may be effective in a subset of prostate cancer patients with acquired resistance to abiraterone acetate. 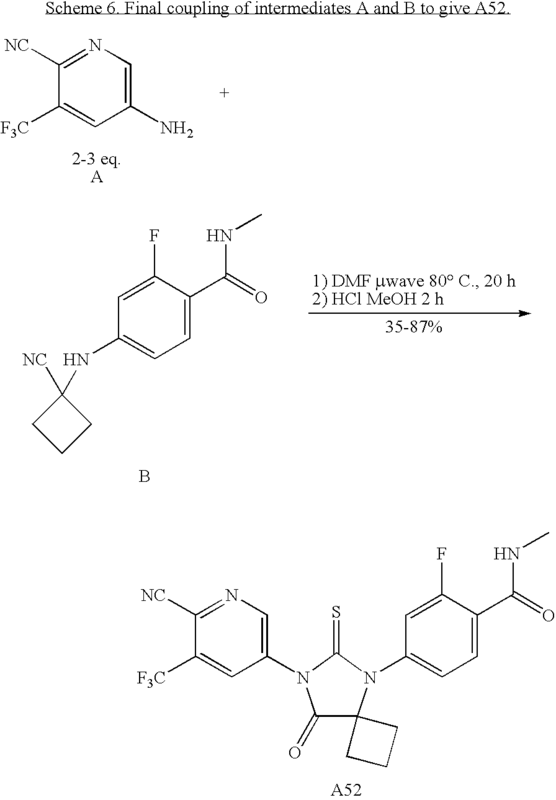 The chemical structure of ARN-509 is very similar structure to that of Enzalutamide (MDV3100) with two minor modifications: (a) two methyl groups in the 5-member ring of MDV3100 is linked by a CH2 group in ARN-509; (b) the carbon atom in the benzene ring of MDV3100 is replaced by a nitrogen atom in ARN-509. ARN-509 is considered as a Me-Too drug of Enzalutamide (MDV3100). ARN-509 was claimed to be more active than Enzalutamide (MDV3100). ARN-509 is a novel 2nd Generation anti-androgen that is targeted to treat castration resistant prostate cancers where 1st generation anti-androgens fail. 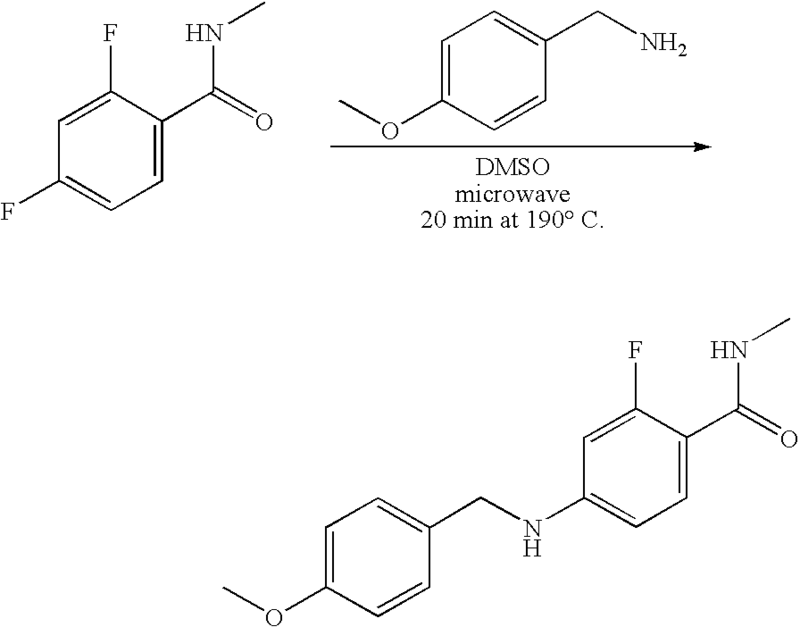 ARN-509 is unique in its action in that it inhibits both AR nuclear translocation and AR binding to androgen response elements in DNA. Importantly, and in contrast to the first-generation anti-androgen bicalutamide, it exhibits no agonist activity in prostate cancer cells that over-express AR. ARN-509 is easily synthesized, and its oral bioavailability and long half-life allow for once-daily oral dosing. In addition, its excellent preclinical safety profile makes it well suited as either a mono- or a combination therapy across the entire spectrum of prostate cancer disease states. (source: http://www.aragonpharm.com/programs/arn509.htm). Prostate cancer is one of the most common forms of cancer found in Western men and the second leading cause of cancer death in Western men. When prostate cancer is confined locally, the disease can usually be treated by surgery and/or radiation. Advanced disease is frequently treated with anti-androgen therapy, also known as androgen deprivation therapy. Administration of anti-androgens blocks androgen receptor (AR) function by competing for androgen binding; and therefore, anti-androgen therapy reduces AR activity. Frequently, such therapy fails after a time, and the cancer becomes hormone refractory, that is, the prostate cancer no longer responds to hormone therapy and the cancer does not require androgens to progress. Overexpression of AR has been identified as a cause of hormone refractory prostate cancer (Nat. Med., 10:33-39, 2004; incorporated herein by reference). Overexpression of AR is sufficient to cause progression from hormone sensitive to hormone refractory prostate cancer, suggesting that better AR antagonists than the current drugs may be able to slow the progression of prostate cancer. 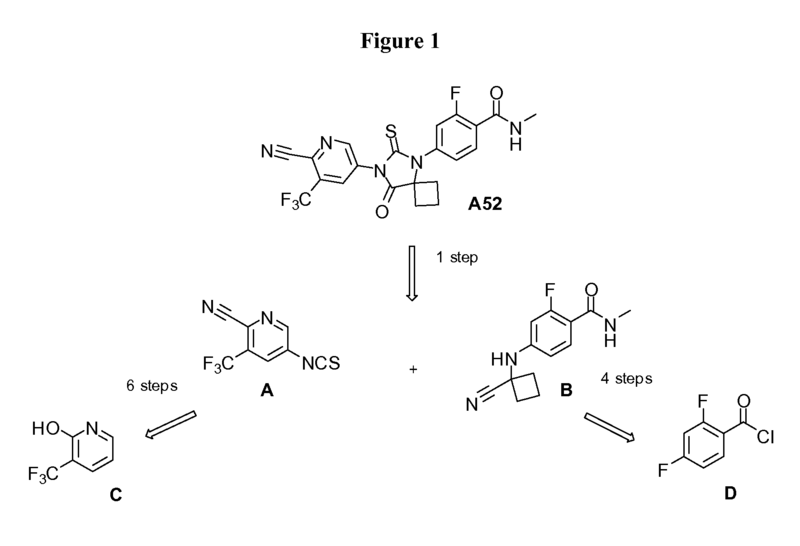 It has been demonstrated that overexpression of AR converts anti-androgens from antagonists to agonists in hormone refractory prostate cancer. This work explains why anti-androgen therapy fails to prevent the progression of prostate cancer. 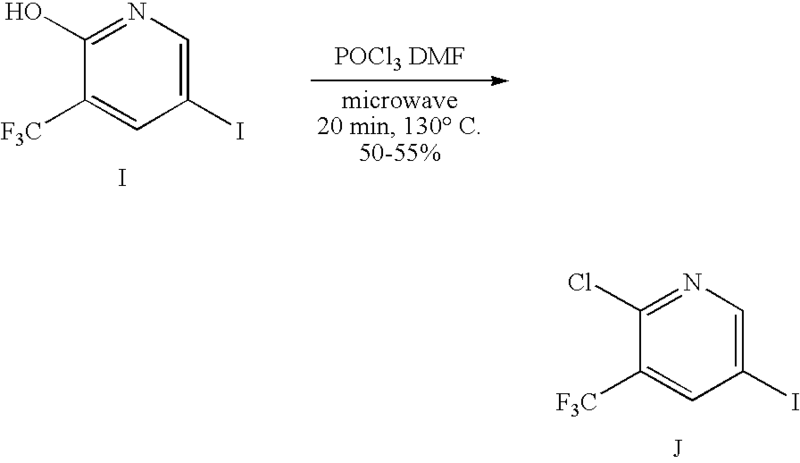 Both of these compounds share the same western and central portions. Given the need for larger quantities of pure A51 and A52 for pre-clinical and clinical studies, there remains a need for a more efficient synthesis of the compound from commercially available starting materials. 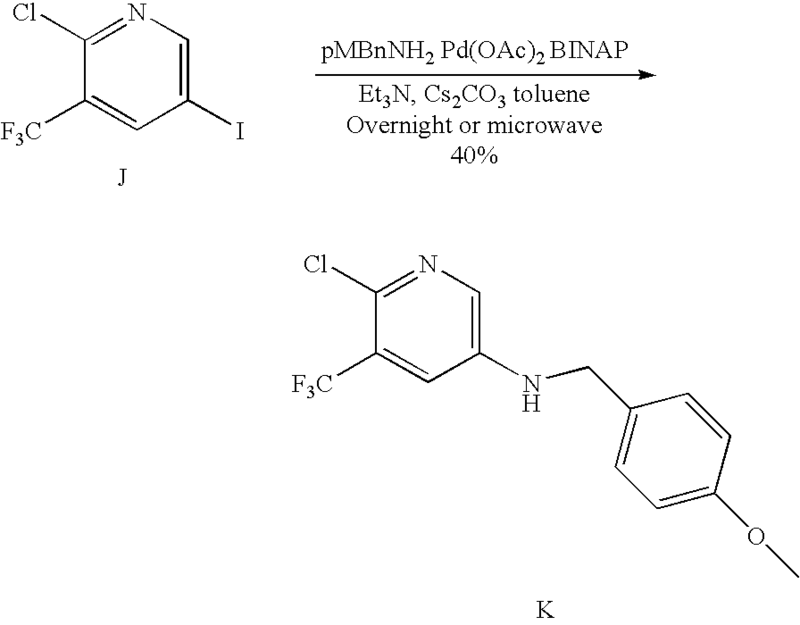 The final coupling step between intermediates A and B is achieved by microwave irradiation and cyclization to the biarylthiohydantoin A52 (Scheme 6). Although 3 equivalents of A are required for the highest yields in this transformation, the un-reacted amine A can be recovered. 1H NMR (400 MHz CDCl3) δ 7.20 (d, J=2.4 Hz, 1H), 8.22 (d, J=2.4 Hz, 1H). 3-trifluoromethyl-2-pyridinol (25 g, 153.3 mmol) is dissolved in anhydrous CH3CN (150 mL) and DMF (150 mL). N-iodosuccinimide (34.5 g, 153 mmol) is then added. The reaction mixture is stirred at 80° C. for 2 hours and cooled to room temperature. Aqueous 1 M NaHCO3 (150 mL) is then added to the cooled mixture. After stirring for 5 min, the solvents are evaporated to dryness. Water is added and the aqueous phase is extracted (×2) with dichloromethane. The organic phase is then evaporated and the desired product is recrystallized in water to afford 36.2 g (81%) of a white powder. 1H NMR (500 MHz, CDCl3) δ 7.85 (d, J=2.3, 1H); 7.98 (d, J=2.3, 1H), 13.41 (br s, 1H); 13C NMR (250 MHz CDCl3) δ 63.0, 121.4 (q, JC-F=272.3 Hz), 122.2 (q, JC-F=31.6 Hz), 144.4, 148.1 q, (JC-F=5.0 Hz), 160.1. To an ice-cold mixture of POCl3 (1.60 mL) and DMF (1 mL) in a microwave vial, 5-iodo-3-trifluoromethyl-2-pyridinol (1 g, 3.47 mmol) is added. The vial is sealed and heated 20 min at 110° C. The reaction mixture cooled at room temperature is poured into ice cold water. The product precipitates. The precipitate is filtered, washed with cold water and dried to afford 661 mg (62%) of a light brown powder. 1H NMR (500 MHz CDCl3) δ 8.32 (d, J=2.0 Hz, 1H), 8.81 (d, J=2.0 Hz, 1H). 13C NMR (250 MHz CDCl3) δ 89.4, 121.2 (q, JC-F=273.3 Hz), 126.8 (q, JC-F=33.6 Hz), 144.34, 148.5, 158.7. 2-choro-5-iodo-3-trifluoromethylpyridine is dried under vacuum. To a slurry of chloroiodpyridine (10 g, 32.6 mmol) in toluene (anhydrous) (98 mL) is added sequentially. Pd(OAc)2 (220 mg, 0.98 mmol, 0.03 eq), rac-BINAP (609 mg, 0.98 mmol, 0.03 eq) solid Cs2CO3 (53 g, 163 mmol, 5 eq), paramethoxybenzylamine (4.05 mL, 30.9 mmol, 0.95 eq) and triethylamine (0.41 mL, 2.93 mmol, 0.09 eq). The resulting slurry is degassed (×2) by vacuum/Argon backfills. The mixture is heated to reflux overnight. The mixture is then cooled to room temperature and H2O is added. The layers are separated and the toluene layer is concentrated under vacuo. The residue is purified by flash chromatography on silica gel (Hexane/EtOac; 95:5 to 30/70) to afford 4 g of white solid desired compound (40%). 1H NMR (500 MHz CDCl3) δ 3.81 (s, 3H), 4.29 (d, J=5.1 Hz, 2H), 4.32 (br s, 1H), 6.90 (d, J=8.1 Hz, 2H), 7.19 (d, J=2.9 Hz, 1H), 7.26 (d, J=8.1 Hz, 2H), 7.92 (d, J=2.9 Hz, 1H). 13C NMR (250 MHz CDCl3) δ 47.3, 55.4, 114.3, 119.3 (q, JC-F=5.1 Hz), 122.3 (q, JC-F=272.9 Hz), 124.80 (q, JC-F=32.7 Hz), 128.8, 129.1, 135.1, 136.6, 142.9, 159.3. A suspension of vacuum dried 2-choro-5-iodo-3-trifluoromethylpyridine (50 g, 163 mmol) in anhydrous toluene (1,500 mL) was treated sequentially with Pd2(dba)3 (2.98 g, 3.25 mmol, 0.02 eq), Xantphos (5.65 g, 9.76 mmol, 0.06 eq), solid t-BuONa (23.4 g, 243 mmol, 1.5 eq), and paramethoxybenzylamine (23.2 mL, 179 mmol, 1.1 eq). The resulting slurry is degassed by vacuum/argon backfills for 10 min. The mixture is then quickly brought to reflux by a pre-heated oil bath. After 1.5 hours at this temperature, the mixture was cooled to the ambiant, and the solids were removed by filtration over a packed bed of celite and washed with toluene. The filtrate was then diluted with EtOAc (200 mL), then washed with H2O. The organic layer was concentrated under reduced pressure gave an oily solid. Crystallization from DCM/Hexane gave (36.6 g, 71%) of B as a light yellow solid. Alternatively, smaller scales (5 to 10 gr of A) were purified by column silica gel chromatography using the gradient system Hexane-EtOAc 19-1 to 3-7 (v-v). This gave yields in excess of 85% of B as a white solid. Zinc cyanide (0.45 g, 3.80 mmol, 1.2 eq) is added to the chloride (1 g, 3.16 mmol) solubilized in DMF (20 ml). The solution is degassed for 10 minutes. Then the ligand dppf (0.35 g, 0.63 mmol, 0.2 eq) is added. The solution is degassed again for 5 min. The catalyst Pd2(dba)3 (0.29 g, 0.32 mmol, 0.1 eq) is added, the solution is degassed for 5 more minutes. The reaction mixture is then heated at 150° C. for 10 min. After filtration, the solvent is evaporated and the crude residue is purified by flash chromatography on silica gel (hexane/EtOAc) to afford 900 mg (93%) of a dark yellow oil. 1H NMR (500 MHz CDCl3) δ 3.82 (s, 3H), 4.37 (d, J=5.3 Hz, 2H), 4.93 (br s, 1H), 6.92 (d, J=9.5, 2H), 7.08 (d, J=2.7 Hz, 1H), 7.25 (d, J=9.5, 2H), 8.17 (d, J=2.7 Hz, 1H). 13C NMR (250 MHz CDCl3) δ 46.7, 55.4, 113.9, 114.5, 115.9, 116.1, 122.0 (q, JC-F=274.5 Hz), 128.0, 128.9, 131.4 (q, JC-F=33.1 Hz), 138.68, 145.9, 159.5. TFA (1 mL) is added dropwise to a solution of pyridine L (83 mg, 0.27 mmol) in dry DCM (0.5 mL) under argon. The solution is stirred overnight at room temperature. After completion of the reaction, the solvent is evaporated and the residue is purified by flash chromatography on silica gel (Hexane/EtOac) to afford the desired product quantitatively. 1H NMR (500 MHz CDCl3) δ 7.20 (d, J=2.4 Hz, 1H), 8.22 (d, J=2.4 Hz, 1H). For the larger scales, an improved process calls for dissolving pyridine L (53 g, 0.172 mol) in TFA/DCM (170 mL, 4:1) at room temperature. Upon reaction completion (approximately 2 hours at room temperature), the volatiles were removed under reduced pressure. The residue is then diluted with EtOAc (800 mL), and washed with saturated aqueous NaHCO3. Vacuum concentration and precipitation from DCM-Hexane (1-2, v-v) gave a relatively clean product. Further washing with DCM gave pure intermediate H as a white solid (27.43 g, 85%). 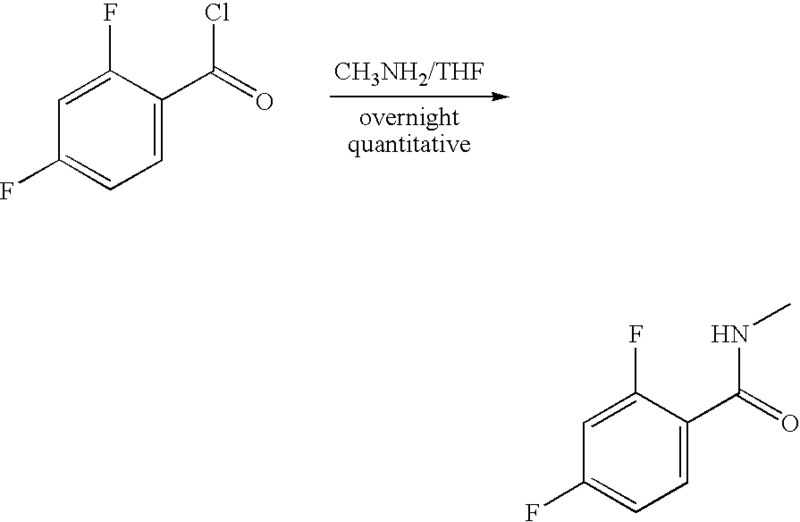 Methylamine 2M in THF (12.4 mL, 1.1 eq) is added to neat 2,4-difluorobenzoyl chloride (4 g, 22.6 mmol). The reaction mixture is stirred overnight at room temperature. The solvent is evaporated, ethyl acetate is added to solubilize the residue. The organic is washed with aqueous NaHCO3, dried with Na2SO4, filtered and evaporated to afford the quantitatively the desired compound as a white powder. 13C NMR (100 MHz CDCl3) δ 27.0, 104.3 (d, J=26.0 Hz), 104.6 (d, J=25.9 Hz), 112.4 (dd, J=21.2; 3.1 Hz), 118.1 (dd, J=12.4; 3.8 Hz), 133.7 (dd, J=10.1; 3.9 Hz), 162.9 (dd, J=381.1; 12.3 Hz), 163.5. 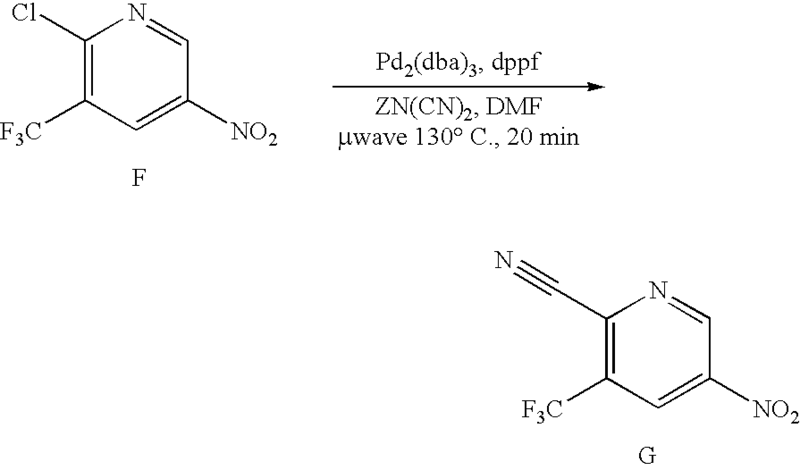 Paramethoxybenzylamine (0.069 mL, 0.548 mmol, 2 eq) is added to methyl 2,4-difluorobenzylamide (47 mg, 0.274 mmol) dissolved in dimethylsulfoxide (0.5 mL). The reaction mixture is heated at 190° C. for 20 min in a microwave. After completion the solvent is evaporated and the residue is purified by flash chromatography on silica gel (hexane/ethyl acetate) to give 18 mg (20%) of the desired product. 1H NMR (500 MHz CDCl3) δ 2.98 (d, J=4.5 Hz, 3H), 3.81 (s, 3H), 4.26 (d, J=5.3 Hz, 2H), 4.47 (br s, 1H), 6.23 (dd, J=2.2; 15.1 Hz, 1H), 6.45 (dd, J=2.2; 8.7 Hz, 1H), 6.58 (br s, 1H), 6.89 (d, J=8.7 Hz, 2H), 7.25 (d, J=8.7 Hz, 2H), 7.91 (t, J=9.0 Hz, 1H). 13C NMR (500 MHz CDCl3) δ 26.6, 47.3, 55.3, 98.2 (d, J=29.7 Hz), 109.25, 114.4, 128.6, 129.9, 133.1 (d, J=4.5 Hz), 152.3 (d, J=12.5 Hz), 159.1, 161.5, 163.9 (d, J=244 Hz), 164.5. 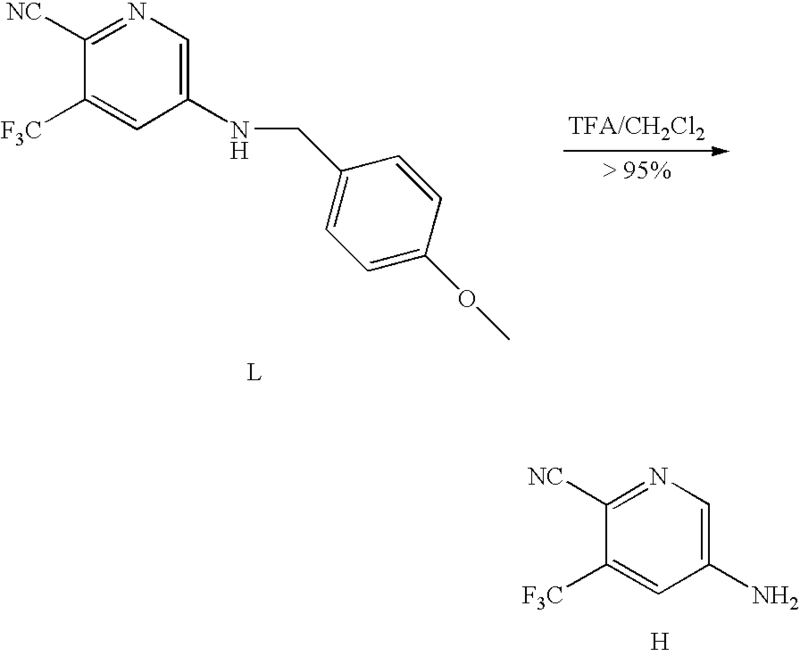 TFA (1 mL) is added dropwise to a solution of methylamide (60 mg, 0.21 mmol) in dry DCM (0.5 mL) under argon. The solution is stirred overnight at room temperature. After completion of the reaction, the solvent is evaporated and the residue is purified by flash chromatography on silica gel (Hexane/EtOac) to afford the desired product quantitatively. 1H NMR (500 MHz CDCl3) δ 2.98 (d, J=4.8 Hz, 3H), 4.15 (br s, 2H), 6.32 (d, J=14.3 Hz, 1H), 6.48 (d, J=8.2 Hz, 1H), 6.61 (br s, 1H), 7.90 (dd, J=8.6 Hz, 1H), 13C NMR (500 MHz CDCl3) δ 26.63, 100.8 (d, J=28.8 Hz), 110.3 (d, J=244.6 Hz), 110.9, 133.3 (d, J=4.3 Hz), 151.4 (d, J=12.5 Hz), 162.2 (d, J=244.6 Hz), 164.3 (d, J=3.5 Hz). 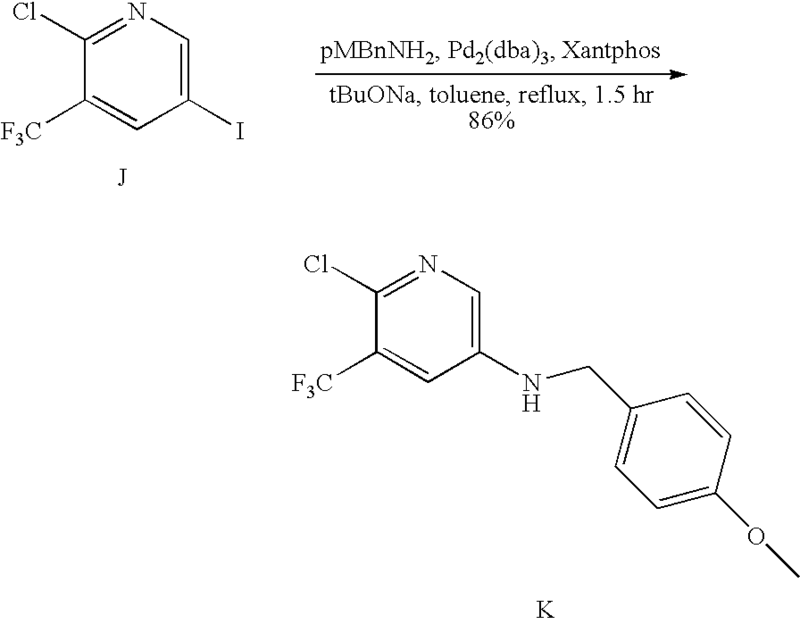 Thiophosgene (1.2 mL, 1.16 eq, 15.6 mmol) is added dropwise to a solution of 5-amino-2-cyano-3-trifluoromethylpyridine (2.8 g, 1.1 eq, 15.0 mmol) and N-methyl-4-(1-cyanocyclobutylamino)-2-fluorobenzamide (3.35 g, 13.5 mmol) in dry DMF (25 mL) under Argon. The solution is stirred overnight at 60° C. To this mixture were added MeOH (60 mL) and aq. 2M HCl (30 mL), then the mixture was reflux for 2 h. After cooling to rt, the mixture was poured into ice water (100 mL) and extracted with EtOAc (3×60 mL). The organic layer was dried over Mg2SO4, concentrated and chromatographed on silica gel using 5% acetone in DCM to yield the desired product (2.65 g, 41%). 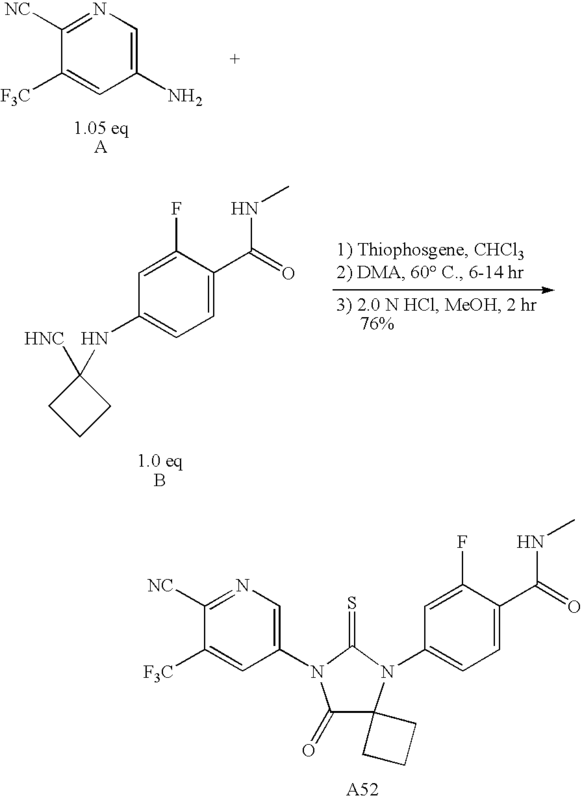 Thiophosgene (1.23 mL, 16.0 mmol) is added dropwise to a solution of 5-amino-2-cyano-3-trifluoromethylpyridine (3.0 g, 16.0 mmol) and N-methyl-4-(1-cyanocyclobutylamino)-2-fluorobenzamide (3.96 g, 16.0 mmol) in dry DMA (35 mL) under Argon. The solution is stirred overnight at 60° C. To this mixture were added MeOH (60 mL) and aq. 2M HCl (30 mL), then it was brought to reflux temperature for 2 h. After cooling down to the ambiant, the mixture was poured into ice water (100 mL) and extracted with EtOAc (3×60 mL). The organic layer was dried over Mg2SO4, filtered over celite, and concentrated under reduced pressure. Silica gel chromatography using DCM/-acetone 19-1 (v-v) yielded the desired product (5.78 g, 76%). 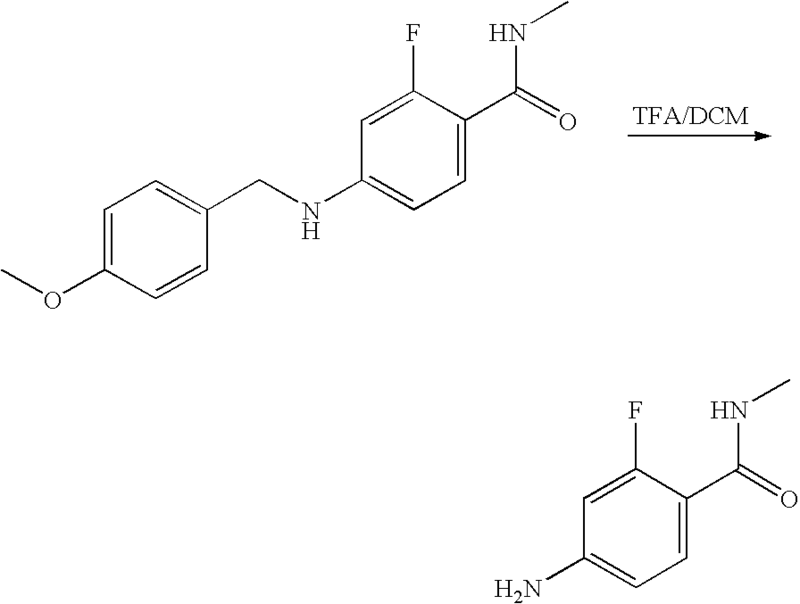 Thiophosgene (5.48 mL, 1.05 eq, 70.9 mmol) is added dropwise to a solution of 5-amino-2-cyano-3-trifluoromethylpyridine (13.27 g, 1.05 eq, 70.9 mmol) and N-methyl-4-(1-cyanocyclobutylamino)-2-fluorobenzamide (16.7 g, 67.5 mmol) in dry DMA (110 mL) under Argon at 0° C. After 10 min, the solution was heated up to 60° C. and allowed to stir at that temperature for an overnight period. This was then diluted with MeOH (200 mL) and treated with aq. 2M HCl (140 mL), then the mixture was refluxed for 2 h. After cooling down to RT, the mixture was poured into ice water (500 mL), and filtered over buchner. The solid was recrystallized from DCM/EtOH to get desired product (20.6 g, 64%). 1 Clegg NJ, Wongvipat J, Joseph JD, Tran C, Ouk S, Dilhas A, Chen Y, Grillot K, Bischoff ED, Cai L, Aparicio A, Dorow S, Arora V, Shao G, Qian J, Zhao H, Yang G, Cao C, Sensintaffar J, Wasielewska T, Herbert MR, Bonnefous C, Darimont B, Scher HI, Smith-Jones P, Klang M, Smith ND, De Stanchina E, Wu N, Ouerfelli O, Rix PJ, Heyman RA, Jung ME, Sawyers CL, Hager JH (2012). “ARN-509: a novel antiandrogen for prostate cancer treatment”. Cancer Res. 72 (6): 1494–503. doi:10.1158/0008-5472.CAN-11-3948. PMC 3306502. PMID 22266222. Patel JC, Maughan BL, Agarwal AM, Batten JA, Zhang TY, Agarwal N (2013). “Emerging molecularly targeted therapies in castration refractory prostate cancer”. Prostate Cancer 2013: 981684. doi:10.1155/2013/981684. PMC 3684034. PMID 23819055. Schweizer MT, Antonarakis ES (2012). “Abiraterone and other novel androgen-directed strategies for the treatment of prostate cancer: a new era of hormonal therapies is born”. Ther Adv Urol 4 (4): 167–78. doi:10.1177/1756287212452196. PMC 3398601. PMID 22852027. Rathkopf D, Scher HI (2013). “Androgen receptor antagonists in castration-resistant prostate cancer”. Cancer J 19 (1): 43–9. doi:10.1097/PPO.0b013e318282635a. PMC 3788593. PMID 23337756. Pinto Á (2014). “Beyond abiraterone: new hormonal therapies for metastatic castration-resistant prostate cancer”. Cancer Biol. Ther. 15 (2): 149–55. doi:10.4161/cbt.26724. PMC 3928129. PMID 24100689. Leibowitz-Amit R, Joshua AM (2012). “Targeting the androgen receptor in the management of castration-resistant prostate cancer: rationale, progress, and future directions”. Curr Oncol 19 (Suppl 3): S22–31. doi:10.3747/co.19.1281. PMC 3553559. PMID 23355790. Agarwal N, Di Lorenzo G, Sonpavde G, Bellmunt J (2014). “New agents for prostate cancer”. Ann. Oncol. 25 (9): 1700–9. doi:10.1093/annonc/mdu038. PMID 24658665. Joseph JD, Lu N, Qian J, Sensintaffar J, Shao G, Brigham D, Moon M, Maneval EC, Chen I, Darimont B, Hager JH (2013). “A clinically relevant androgen receptor mutation confers resistance to second-generation antiandrogens enzalutamide and ARN-509”. Cancer Discov 3 (9): 1020–9. doi:10.1158/2159-8290.CD-13-0226. PMID 23779130. Nelson WG, Yegnasubramanian S (2013). “Resistance emerges to second-generation antiandrogens in prostate cancer”. Cancer Discov 3 (9): 971–4. doi:10.1158/2159-8290.CD-13-0405. PMC 3800038. PMID 24019330. 11Clegg NJ, Wongvipat J, Tran C, Ouk S, Dilhas A, Joseph J, Chen Y, Grillot K, Bischoff ED, Cai L, Aparicio A, Dorow S, Arora V, Shao G, Qian J, Zhao H, Yang G, Cao C, Sensintaffar J, Wasielewska T, Herbert MR, Bonnefous C, Darimont B, Scher HI, Smith-Jones PM, Klang M, Smith ND, de Stanchina E, Wu N, Ouerfelli O, Rix P, Heyman R, Jung ME, Sawyers CL, Hager JH. 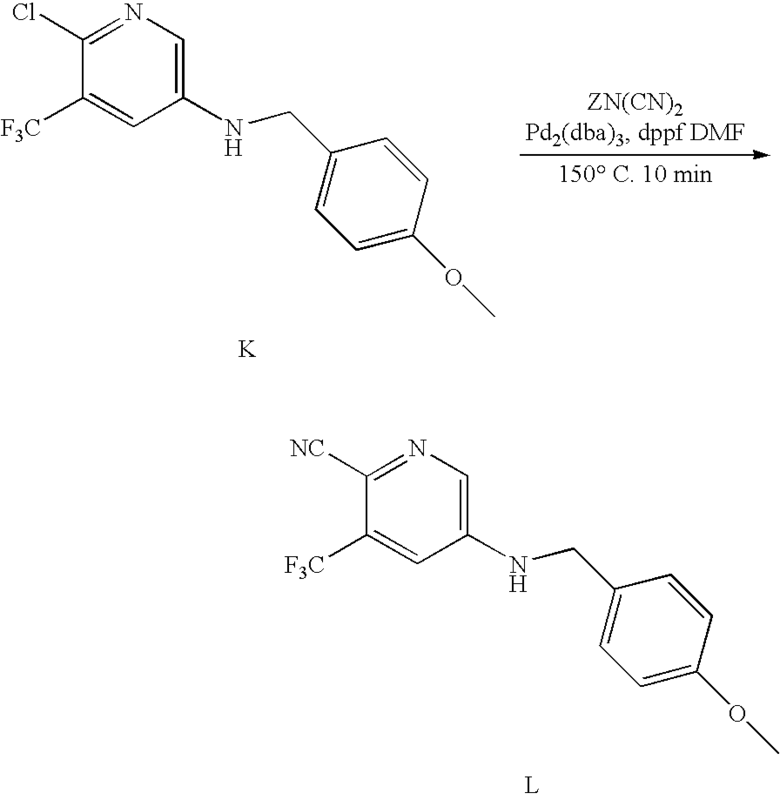 ARN-509: a novel anti-androgen for prostate cancer treatment. Cancer Res. 2012 Mar 15;72(6):1494-1503. Epub 2012 Jan 20.PubMed PMID: 22266222. 12]. Clegg NJ, Wongvipat J, Joseph JD et al. ARN-509: a novel antiandrogen for prostate cancer treatment. Cancer Res. 2012 Mar 15;72(6):1494-503.
. Courtney KD, Taplin ME. The evolving paradigm of second-line hormonal therapy options for castration-resistant prostate cancer. Curr Opin Oncol. 2012 May;24(3):272-7.
. Schweizer MT, Antonarakis ES. Abiraterone and other novel androgen-directed strategies for the treatment of prostate cancer: a new era of hormonal therapies is born. Ther Adv Urol. 2012 Aug;4(4):167-78. By DR ANTHONY MELVIN CRASTO Ph.D in Phase3 drugs, Uncategorized on March 11, 2016 .